1. The concept of Imperialism is the thought of extending power over another place and expecting complacency and the taking of your culture. 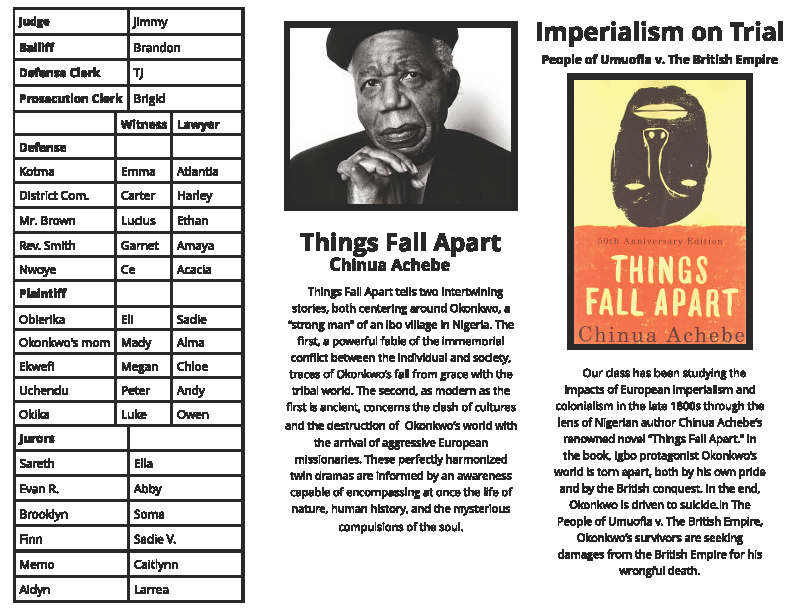 We learned about this by reading the novel Things Fall Apart by Chinua Achebe. In this book we took a look at Okonkwo a prominent figure in Umuofia (now Nigeria) and the affects of British colonialism and it’s changes to an already strong society. In the end of the book Okonkwo takes his life, which is a sin greater than all else in the Umuofian culture. Our final Exhibition was a mock trial on the case of The People of Umuofia v. The British Empire. Which is a wrongful death case over if the British empire pushed Okonkwo to his death, or he was simply unstable. In this project we reflected on what power over people means. 4. The most enduring understanding I will take away from this project is what influences people in their lives, be it an outside force or inner turmoil. In learning about what slavery and colonialism did to Africa as opposed to the traditional “what Africans did for us”. I feel that I now have a better and less culturist version of what Africa is. I feel also that we are influenced by many sources in our lives, such as depression, peer pressure and in a way adult imperialism. Extension of what we should be through the eyes of our parents. I think that youth as a whole are taught that we are all part of a stereotype, we are all drug addicts, thieves, liars and promiscuous. This is a type of imperialism in itself. I have learned a lot throughout these three months. our​ ​culture​ ​but​ ​it​ ​is​ ​not​ ​our​ ​place​ ​to​ ​change​ ​that​ ​of​ ​others.